The power of Flynet DataConnect is that you can publish your queries as web services. Web services can then be consumed by a client, such as SAP Dashboard Design or Xcelsius. You create and manage web services on the Web Services tab. You have a choice of security models, and can run tests to make sure the web service is behaving as expected. 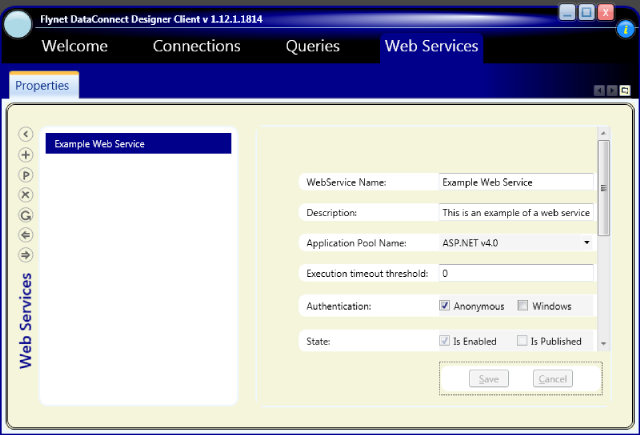 You can also see the important WSDL link used by web service clients such as SAP Dashboard Design or Xcelsius.